Looking for LCHF Thermomix recipes? Or maybe you are just wondering, “What is LCHF?” In Episode 123, we’ve got the super talented Thermo-Foodie and The Chef to discuss LCHF Thermomix recipes, their LCHF journey and their first book in a four Thermomix book series on Low Carb Healthy Fat (LCHF) ‘Getting Started’. So who is the Thermo-Foodie and who is the Chef? Daniela is the foodie and Michelle is the chef. They are both mums and former Thermomix consultants. They’re passionate about helping people adopt an LCHF lifestyle. Standing for “Low Carb Healthy Fat”, Thermo-Foodie and the Chef’s recipes follow an LCHF way of eating. As we discuss in the podcast, this way of eating aligns with the Real Meal Revolution/Banting lifestyle using information & scientific research sourced by Professor Noakes and his Real Meal Revolution team. The LCHF philosophy is gaining huge popularity. Seeing a high demand for a specific LCHF Thermomix recipes, the girls created ‘Getting Started’. It is the first in a series of four books Thermo-Foodie and the Chef will be releasing. In this podcast we ask the girls for their top tips around getting started and making LCHF simple. Their recipes include breakfast dishes like almond pancakes, spiced nutty granola, and cinnamon, berry porridge; nutritionally-packed mains include super dough pizzas, macadamia satay chicken with cauliflower rice, and lasagne with a creamy, psyllium husk pasta-layer substitute. Indulgent desserts include a decadent cacao-rich celebration mousse cake and after-dinner mint slice. We asked Michelle and Daniela about their favourite recipe from their book and they both came up with… Butter Chicken! They have kindly shared this recipe with you on their blog. Check out their recipe here. Want a chance to win a copy? Check out the contents of this awesome book, leave us a note in the comments below (before midnight, Sunday October 30 2016) and tell us what you would most like to make! CONGRATULATIONS to Carole Moore who has won this competition. You can grab your very own copy of this fabulous book over at Thermo-Foodie and Chef’s website. Absolutely crackers and the salmon salad!!! Scrumptious! I really want to try the macadamia satay chicken on cauliflower rice! So many recipes I’d like to try!!! But I’m thinking the first I’d make is the LCHF real lasagne as I’m really missing lasagne. I love Thermo Foodies recipes! I haven’t tried it yet but I’m looking forward to trying the LCHF Lasagne and the Caesar Dressing. Love the sound of this book. I would definitely make the celebration mousse cake to help show my family and friends that this way of eating can taste so good! Id love to try the LCHF Real Lasagne and the Garlic Cumin Naan. Yum sounds awesome! This is completely up my alley of foods I already love to eat and I’ve wanted to reduce my carb intake for quite awhile. There are lots of items in this list I’d love to make but i think the Salmon, Broccoli and Danish Feta Salad would be the first on the list. The weather is now warming up so it’s salad season! OMG definitely the Choc Fudge Cupcakes but what is great is that so many of these recipes look amazing, looking forward to listening to the podcast…when I’m not at work! I’m looking forward all the recipes, but most of all the Hollandaise sauce. Thank you for such fantastic recipes. How exciting! This may be just the thing to start me on my LCHF journey. I would love to try the LCHF real lasagne. Coming from an Italian family, I really miss Lasagne and a LCHF version should cater to my allergy and intolerance needs. So many items there that look incredibly inviting! Oh there are too many choices!!!!!! The lasagne maybe as my kids are completely into that at the moment, after years of telling them how delicious lasagne is. Cookies and cream ice cream!! I really want to try making the Bounty Slice. Giving up bars of chocy is the hardest for me on lchf – and Bounty bars are my absolute favourite! To find a lchf alternative is awesome! Thanks Foodie and the Chef? I just LOVED this one! I’ve been looking into the LCHF thingo, and was totally lost. Loved the girls website. I think, the feta avocado smash on toast sounds like a winner, as I always go straight to something boring like weetbix. Blergh! I think salmon, broccoli and Danish feta salad sounds fantastic. I would love to make the Cookies and Cream Ice Cream. My family love their sweets and to be able to make a healthy version that will be low carb and providing them with good fats instead of sugar and preservatives would be fantastic! I would love to try the Creamy Coffee Ice Cream. YUM! How awesome! I’ve just started LCHF and am searching for good recipes! Way too many carbs in these recipes! Totally inspired with the 123 podcast Thermo-Foodie & the Chef. Desperately need to lose weight and would love ❤️ to win a copy of their first book “Getting Started”. My choice of recipe to cook would be Brown Butter Mushroom Soup. The sound of the blueberry muffin breakfast smoothie has me salivating, I would love to try the LCHF real lasagne as it’s my 10 month old and 8 year olds favourite meal and my 5 year old and I would love to eat, I mean make, the after dinner mint slice. the creamy coffee ice cream sounds delish! i would like to try that! My pick – Macadamia Satay Chicken with Cauliflower Rice, I love a good Satay but always avoid it and try to pick a healthy alternative. With these recipes I would be able to have my cake & eat it too!! I would love to try the Feta Avocado smash on toast and the lasagne. Mmm – Being a salad afficianado, coming up to Summer, I’d like to try the Salmon, Broccoli and Danish Feta Salad. Really interested in learning more about the LCHF style of eating. No 27 Boccocini stuffed meatballs, zucchini noodles and marinara sauce sounds perfect for me. Being gluten, dairy and caffeine chronically intolerant brings back to me what I have been missing since being diagnosed. I have been homeless since 2011 and my Thermomix is my companion and portable kitchen. I can eat healthy as well cheap and have done so since 2009! Breakfast can be hard on LCHF, sometimes I need a break from bacon and eggs and feel like something sweet. I love that the breakfast list has pancakes, porridge and granola – lots of yummy options! Whenever I think Low Carb, I think no breads or crackers and I LOVE these! I am really looking forward to the Bread/crackers section! Bring it on ? I was leaning toward the almond pancakes…then I saw the creamy coffee ice cream. It wins hands down! the freezer is full of homegrown grass fed galloway beef so i would love to try the grass fed beef burger ! After the i would work my way through the index. Ohhhh the brown butter mushroom soup and the butter chicken with cauliflower rice both sound mouth watering!! Thanks for featuring this, recently been advised to adopt a LCHF diet by my specialist and was dreading having to convert all the recipes for my thermi ?? The pumpkin scones with cinnamon butter sound yum! I haven’t really come across an inspiring recipe for GF pumpkin scones since being diagnosed with Coeliac disease. Love a completely GF healthy Thermomix cookbook! Coconut and lime panna cotta-a refreshing way to end the day !!! Oh finally. I am so keen to start LCHF for inflammatory purposes. I am already gluten free. I want sure how I would start though because I wanted to keep using my thermie. The LCHF lasagne would be my pick. Yum. I want to cook it all. As a relative newbie to Thermomix I would like to try anything. All the recipes look good. I have worked in the fitness industry for the last 30 years, and have seen it all as far as fad diets go. Having done the research on this eating approach, I see it makes sense, but it is so hard to find alternatives for rice, pasta and bread. I am really excited to see some recipes like lasagna and Baan, and can’t wait to try them out! Ooh the raspberry chia coulis! Would yummy for summer! Would love a kickstart to my LCHF journey ? The LCHF Real Lasagne sounds fantastic! Would love to try this with my family. OMG…where do I start…I really have to pick what I’d like to make……All of it….lol ..but if I was pushed it would have to be the Brown Butter and Mushroom sauce as a starter followed by the LCHF Real lasagne for mains with yummy Bread rolls and lovely Choc Fudge Cupcakes with a black coffee to finish a perfect meal.. I have already lost 7kg on my LCHF on my journey with low carb….but looking at all the choice you have created I’m excited. Bread is my one weakness so I would love to make some LC bread. ..Well done girls ? I’m struggling with ideas for breakfast, especially for my kids who would rather not have breakfast making it a struggle! Lots of amazing breakfast ideas here! I would love to try the breakfast options. I hate breakfast and need something yummy and easy to tempt me to eat!! Steamed omelette sounds nice ? Where do I start these recipes look great. But if I had to pick one that I would try first, then Bounty Slice is it. I love chocolate and always chasing healthier options. All the meals sound fantastic!! Hi, I’ve been on a LCHF diet on a off for quite a few years now and I’m back on it yet again. When I started, there were hardly any recipes online, but Carol Sinclair’s book (IBS Low Starch diet) was a great help. With the publication of the new research proving that a LCHF is more beneficial and effective a number of new websites came to life, of which I highly recommend Diet Doctor. I have actually written to Thermomix asking them if they were going to publish a book with LCHF recipes as this diet is quickly growing in popularity, but they just replied that they passed my comments to the relevant department. I’ve been waiting for a LCHF book for Thermomix for years, so you can imagine my delight to see that you have published one! I’m keen to try all of the recipes, one by one, but if I have to choose one, I’m very keen to try super dough pizzas as pizza is probably the one meal that I miss the most on a LCHF diet. I’m looking forward to all the books, and I’ll definitely be buying them as soon as they come out! Great news! Many thanks. As a long term LCHF follower I am always on the lookout for new recipes, and like many of the others commenting here I would start with the breads and crackers to see how good they are. The meatballs or cookies and cream ice cream! Yum! So many fabulous recipes! I think I’d try the pizza dough first, really miss pizza. I love a good bulletproof coffee, so the variations should be even better, right? Wow! This recipe book sounds amazing. I would make absolutely everything in this book, but the first thing I would make are the Chocolate Cheesecake Butter Bombs. They sound so delish! I’ve been following LCHF pages for a while but haven’t taken the plunge yet. I’d love to try the Super Dough Pizzas to convince the whole family that we can do this! I’ve just started and I would love the cracker recipe and lasagne.. 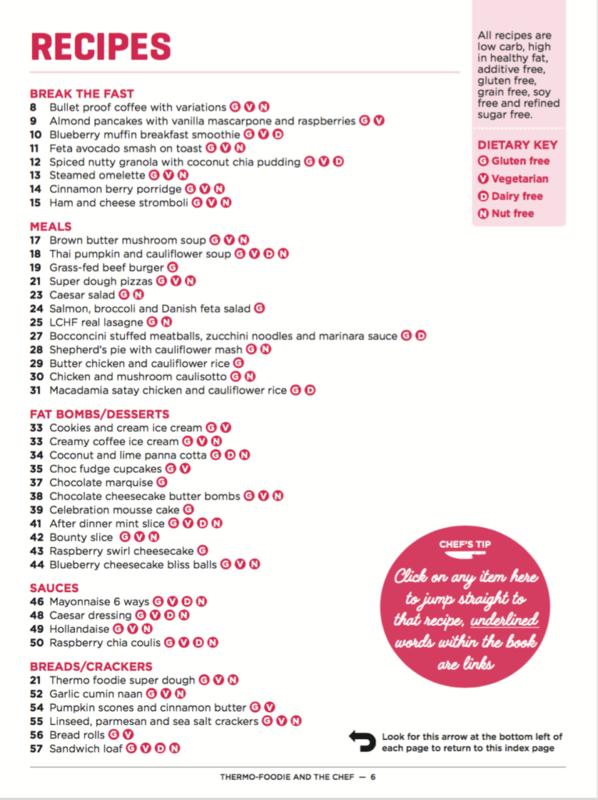 Infant all of the recipes other than the BFC …. I tried it and couldn’t stomach it…. I have been looking at starting this WOE i have been trying to gather recipes but have found it difficult! All the recipes in this book are surprisingly exactly what i was after and better yet are the only Thermomix recipes besides a few skinnymixer ones i have… I would LOVE this recipe book to get me on my way to getting a newer improved me, I need to lose approx 30 kg not only for me but so my children can be proud and i can lead by example and i can stop hiding behind them in photos! Bulletproof coffee – get in my belly ! Would LOVE LOVE LOVE to win this – yew thanks ! My go to at breakfast time has always been a protein smoothie but my interest is wanjng. I would love to have some more variety at breakfast time and the Ham and Cheese Stromboli sounds interesting. I miss my porridge so much. Would love to try the cinnamon berry flavour. But there are so many yummy sounding recipes I don’t think I could stop there!! 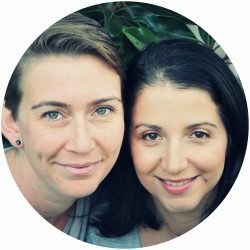 Thank you so much for introducing Daniela and Michelle to us – this is just the book I’ve been looking for to help make LCHF easier for my family. I have been working on following the LCHF way of life for the past 6 months, but with 2 teenage boys have found it hard to find recipes for quick filling low carb meals that they would eat. We are having the butter chicken tonight and I would love to try the bread recipes from Getting Started. So many to choose from but the first recipe would have to be the Macadamia Satay Chicken. I love love love Satay!! Think the breakfasts are where I’d start – pancakes, porridge and chia pudding!! Yum. Please pick me. Thanks for another great interview – I’ve been a member of the LCHF page for a while and wondering how I’d cope with this WOE. The girls gave a very interesting case and I’m really keen to learn more. After the mention of the choc fudge cupcakes on the podcast, that’s all I have been thinking of! They all sound yum!! So much choice I’d say I’d start with the butter chicken with cauli rice to see what the kids think. I’d love to try the Macadamia Satay Chicken! So many recipes awesome recipes! I would love to try the Thai pumpkin and cauliflower soup and the sandwich bread as our family loves bread with soup but being gf and df struggle with this. I love your podcast guys and have just joined the LCHF Facebook page. Keep up the good work. I would love to try the pumpkin scones with cinnamon butter. It sounds delicious. ? I can’t wait to make the cookies and cream ice cream!!! I am new to this way of eating so finding such a gem of information is fantastic, thank you! All the recipes sound amazing but almond pancakes with vanilla mascarpone and raspberry sounds like me for either breakfast lunch or dinner! So hard to choose. .I too am looking into this as a possible way to manage my thyroid and menopause! So I think I would try the bread and the pizza dough because if I can make this and my sceptical OH approves then we are onto a winner! Yum!! Everything looks so good! I’m a sucker for satay so that’s where I would go first! Macadamia satay with Callie rice….. drool!! This book looks amazing!! Wowzers as a Coeliac struggling with what to make this takes the cake, I can try every single recipe and know that I won’t get sick amazing !!!!!! Macadamia Satay Chicken with Cauliflower Rice sounds amazing! Very hard to choose only one. I think the pizza with super dough would be the first thing I would make as home-made pizza is a Friday night family tradition in our house. The one night everyone chooses their own topping and we don’t have any arguments!! My favourite kind of dinner! Would love to try the lasagne! So many choices to choose from – love the look of the salmon salad, the lasagne and the yummy desserts. Hi, I have problems finding GF, LF, CF breakfast ideas so I want to try all the breakfast dishes in the book they all look deliciously yummy! I would love this for the grass fed beef burger! A classic recipe but healthy for the whole family to enjoy while watching the rugby union on a Saturday night – it’s our tradition! The Macadamia Satay Chicken and Cauliflower Rice sounds like a must! The bocconcini stuffed meatballs sound so good! I have newly had myself and youngest child diagnosed as gluten & dairy free. At the moment I am struggling to find everyday recipes for us. I am sure that the recipes in this book will be just where I need to start. With Christmas in mind, Coconut and Lime Pannacotta or the Raspberry Swirl Cheesecake. They would go down a treat with the family. Ugh I can’t pick between the Spiced nutty Granola or the Bocconcini stuffed meat balls! ? Good thing is if I win I’ll make both! Oh wow, I would love to try any of these recipes. They all sound amazing. I bought a TM5 to increase the healthy options and cut out the high fat options myself and my family were eating. This cook book sounds like the winner I need to achieve success! Definitely the Macadamia Satay Chicken and Cauliflower Rice!!!! YUUUUMMM!!!! I would love to try the LCHF lasagne as lasagne is my husbands favourite. At this particular moment, the bullet proof coffee!! Being 30 weeks pregnant and up most of the night with a teething 16 month old, the coffee is very much needed haha ? I can’t decide, it’s too hard. I will be meal planning only from this book. Love living LCHF and the choices in the book are fabulous. You won’t be able to get me out of the kitchen. If I have to choose it will be the super dough, I’ll be making multiple items with that I’m sure. I would absolutely love to try the Shepherd’s pie with Cauliflower mash. There are so many recipes which sound fantastic. So hard to choose! Everything looks amazing. I’d have to say the grass fed beef burger! Yuuuuuuum! Having my weight blow out over last few years i have started looking into the Lchf Idea. Not being a wiz in the kitchen i need all the help i can get. Would love a lot of these recipes and finding it hard to choose one but the macadamia chicken for mains and coconut and lime panna cotta would have to be my choice. Well done on a great recipe book! I would like to try quite a few of these but the brown butter mushroom soup sounds great now that winter is here in the northern hemisphere! My Hubby would love the brown butter and mushroom soup! Would love to make the pizza dough and all the recipes really. Desserts sound amazing too. So many lovely recipes to choose from however, the buttered chicken with cauliflower rice will be a dish my whole family would enjoy. I’d love to try the Garlic and Cumin Naan. The garlic cumin naan – yum! Healthy too can’t wait to try it! Bullet proof coffee with variations sound good, and definitely crackers. Hard but I would try the bread, dough and the bullet proof coffee. Always hard to get these 3 right ! Definitely the Bocconcini stuffed meatballs would be the first one I would try … the kids may be a little hesitant at the zucchini noodles but I think finding gooey cheese inside their meatballs would make their dinner really fun…and yummy too! I would have to start with The gluten free feta avocado smash on toast as it sounds amazing but then again all of the recipes do! Would love t try the cookies and cream icecream and the macadamia chicken satay. Yummy! This is exactly what I need to get me eating properly as I have the exercise sorted. I just love the wrong food. Wow there are some delicious sounding recipes but I would start with the Macadamia Chicken satay with cauliflower rice- I love a great satay! I would really like to try your version of the bread rolls. I have tried a few gluten/grain free ones and always on the look out for a recipe. Thanks so much. Chicken and Mushroom Caulisoto sounds great! salivating as I write this ??? Thai pumpkin and cauliflower soup. I had a bit of a psychological problem with any soup containing pumpkin. I cannot walk past it. If a eatery has a pumpkin soup as the ‘soup of the day’ there is no point me reading the rest of the menu, and no decision to be made. So when I saw this soup on your list, there was no going past it. I was sold. Hi, the book looks fab! I would love to try the salmon, broccoli and Danish feta salad! But it was hard to make a choice, it all looks so delicious! Really want to try the LCHF real lasagna…..I sooooo love (d) pasta dishes and lasagna was one of my go to cook in advance go to work and family just comes home and serves their own …..
Pumpkin Scones with Cinnamon butter sound delicious. I’d love to try that! All the bread options. I miss bread so much, would love to have alternatives, especially ones I can make in my thermie! I have found that my thermie is not getting used much while I try to adapt to LCHF diet. I’d love to try the LCHF lasagna! I reckon the blueberry cheesecake bliss balls would be “the bomb” to make. Healthy with blueberries too. You had me at Hello with After Dinner Mint Slice! Oh my heavens! The brown butter mushroom soup is recipe I’m most wanting to make. I absolutely love making soups and mushroom soup is my favourite! The book looks great ? I reckon the blueberry cheesecake bliss balls sound “the bomb”. Gotta be healthy with blueberries. The mayonnaise 6 ways sounds fabulous. Definitely would love to try that. I would love to try the super dough pizza followed by chocolate mousse celebration cake – sounds soooo yummy! The LCHF real lasagne sounds good to me. I’d love to make brown butter mushroom soup as mushroom soup is one of my favorites. My very best friend is an addicted chocolate lover so the choc fudge cupcakes would be a wonderful ‘good friend’ gift? Tricky, became they all sound great. But I’ll have to go with the celebration mousse cake. Yum! Any of the breakfast recipes and of course the butter chicken and naan ? Would love to make bocconcini stuffed meatballs zucchini noodles & marinara sauce. Interesting flavour combinations. Also the linseed Parmesan & sea salt crackers sound yum. I’m not going to lie, I would be making all of the Fat Bombs/Desserts recipes first ?? Oh Gosh – too many lovelies to choose from – I’d be much more adventurous but my tradie son (22) LOVES lasagne so I’ll vote for that! Thanks so much for this opportunity. Everything sounds amazing. I am just looking into the LCHF way of eating so your podcast is very timely. There are so many recipes I’d like to try from the Thermo Foodie and the Chef’s cookbook but if I have to choose one (sigh!) then it would be the Macadamia Satay Chicken and cauliflower rice – Macadamias and Satay are my two loves! Would love to try the bread recipes. Hoping they are fail safe! Have had a few fails with GF breads. Oh gosh there are too many to choose from!! But I’d really like to make the Thai Pumpkin and Cauliflower Soup, it sounds amazing! i would love to try the spiced nutty granola with coconut chai pudding. It sound like something yummy that i can make ahead of time and grab as we run out the door for breakfast school drop off. 3 different schools across 2 suburbs means it can often be a rush and breakfast gets forgotten about. The boccoccini stuffed meatballs with zucchini noodles and marinara sauce sounds amazing! Would love to try them. I am having chemotherapy at the moment and sometimes I cannot taste some foods. I would like to try the satay chicken with cauliflower rice and also the butter chicken. It’s so hard to just choose one!! Seeing as lasagne was always a family favourite and I haven’t found a suitable replacement it has to be that!? Looking forward to giving the foodie dough a spin. Cookies and cream ice cream! Yummo! Oh wow! What an awesome list of foods! I can’t wait to try the lasagne. One of my.fav foods! I’ve just started my LCHF journey after being diagnosed with Graves Disease 6 weeks ago. I have to watch my weight doesn’t balloon now I’m on meds. I’d start with the After Dinner mint slice. If I won the book it would be awesome, but I’ve just read some of the other comments, and I think perhaps those on a journey dealing with cancer are the most deserving. The first recipe I would make is the real lasagna. It’s one of the few meals that my 2 year old eats while he is teething. The second recipe would be the stuffed meatballs because they sound soooooo good! The first recipe I would love to make is Macadamia Satay Chicken and Cauliflower Rice. The after dinner mint slice definitely would be amongst the first I’d be keen to make! So many amazing sounding recipes to choose from, but the blueberry muffin breakfast smoothie sounds delicious! Would love to try making the pumpkin scones and cinnamon butter! Sounds divine! I love a good sauce so these ones would really make me one saucy person. I would love to try some of the fat bombs! Especially the chocolate cheesecake butter bombs! My carnivores would devour the grass fed beef burgers and the LCHF lasagne. Mmmm Beeeeeef! The breakfast blueberry muffin smoothie sounds yummy. Yum coconut and lime panacotta. Oh! As a mum with a 12 week old and 2.5 year old, caffeine is a daily must have for me. I’d love to try the bullet proof coffee!! Lots of scrumptious recipes to choose from, but I think I’d start with the Bocconcini Meatballs – yum! Shepherds pie is a family favourite! A low carb, thermo version would make life easier! Our whole family need a good gelato kick and I’m really keen to try all the breakfasts because that’s the place I struggle the most. Whoops that should say health kick!!! Hahaha see even autocorrect knows how much help we need with healthy foods!!!!! Starting to eat more this way and still learning. Would love to try the satay macadamia chicken. Sounds delicious ? The Garlic Cumin Naan…I really.miss naan bread with my curries. Such a hard decision – SO many delicious sounding recipes, it’s almost impossible to choose!! But I think I’ll have to go for the Macadamia Satay Chicken with cauliflower rice: macadamias are favourite nuts, I love satay, chicken is always good and cauliflower tastes great plus is so good for you. And to top it all off, it is dairy free, which is exactly what I need. Caesar dressing because it’s dairy free. Lasagne for sure!! Followed by blueberry cheesecake bliss balls!! Thai Pumpkin and Cauliflower Soup for sure! Sounds easy, delicious and a good way to kick off a healthy eating journey ? We’re looking forward to those breakfast recipes, particularly the bulletproof coffee with a 3 month old in the family! Quick and easy breakfast ideas that we can pre-make and have on the go are what I’m needing in the LCHF life. I would love to be try the mayonnaise recipes. So much better than buying it! I have a family of Coeliac’s so I was thrilled to see all the recipes are gluten free. Knowing the limited choices they have with desserts I would definately need to make them the bounty slice. Oh oh oh, I want t cook the whole lot. I would start from the very top and work my way down lol. But first, lasagne, oh yeah !!!! They all sound amazing, but the After-dinner mint slice would be my first pick! Shepards pie and cauli mash!! I would love to try the Brown Butter Mushroom Soup. Definitely garlic cumin naan with butter chicken. Followed by cookies and cream ice cream- because I can eat disgusting amounts and wouldn’t be able to help myself but make three or four recipes straight up-haha!! Despite being morning and extremely hot here, I’m salivating thinking about these meals.Thanks for the opportunity to win one!! I woul love the almond pancakes with marscapone and raspberry. That would be awesome ?? So many choices but love my cauliflower so its a hard fought tie between Thai pumpkin and cauliflower soup or the Shepherds pie with cauliflower mash. I would love to make the choc fudge cupcakes! Just the name makes my mouth water! I cannot wait to try the lasagne. I’ve missed it so much! LCHF Real Lasagne sounds fabulous. One of my favourites that I rarely let myself eat. I’d love to try the Macadamia Satay Chicken and Cauliflower rice. Sounds amazing!!! Choc fudge cupcakes. Hands down! This book will help make the transition for our family so much easier. There are so many recipes I want to try. Thank you so much! Just read this properly. Looking forward to trying the lasagne to get my whole family on this journey! Can’t wait to try these out. Looking forward to trying ALL of these recipes so it’s hard to choose just one but the macadamia satay chicken and cauliflower rice is first up! Sandwich Loaf – gluten, dairy and nut free (and vego friendly) . How can that be? Will it be tasty? Blueberry cheesecake bliss balls ??? I can’t wait to try the brown butter mushroom soup! Sounds amazing. Butter chicken caught my attention- so that’s what I would make if I won’t is book – looks delicious. Butter chicken is what caught my attention- so that’s what I would make if I won this book. Looks delicious! If I had to pick one recipe from this cookbook (I really want to make them all as they look soooo good), I would pick the Chicken and Mushroom Caulisotto. I love risotto, however my waist hmmm not so much! This would be an awesome substitute. We have used Cauliflower in a lot of recipes but I am yet to try a caulisotto. So hard to choose!! First thing I would try is the chicken and mushroom caulisotto – sounds delicious! I’d love to try the bocconcini stuffed meatballs with zucchini noodles and marinara sauce – it sounds amazing! My LCHF interest is blooming because I so desperately want to get in shape while using my thermie every day, and these recipes with their vegie-smuggling and high fibre content look like the answer I have been looking for! Oh my gosh! All of it, I want to try all of it! But mainly the stuffed meatballs! I can’t wait to try the Thai Pumpkin and Cauliflower soup! Mind you I’m pretty sure my family will be picking quite a few things from this book they’d love to try. I’m super keen to bliss out with the blueberry cheesecake bliss balls! This would be an amazing book – I’ve just started 9weeks of personal training and haven’t been using my Thermie as much and this would help me with my food diary each day. How can I choose just one recipe, they all sound great. Just tell me where to buy the book, I never win anything anyway! I love mushroom soup, so the Brown Butter Mushroom soup would be awesome: the breakfast Stromboli sounds great: couldn’t go past the desserts especially the ice cream with, I hope, summer on it’s way soon. So many sound absolutely delicious but I’m leaning towards the Cookies n Cream Icecream and LCHF Lasagne! Creamy Coffee Ice cream. Sounds amazing. Any of the recopies, sweets and crackers are my go to foods so The cookies and cream ice cream, The Mint Slice, the linseed and Parmesan crackers… yum yum and yum again… Can’t wait till they are available……. I really want to try the macadamia satay as my daughter has a peanut allergy so we can’t have normal satay and I miss it! Would also love to try the blueberry cheesecake bliss balls. They sound amazing! Gotta say that I love Bounty Bars. All that coconut and chocolate goodness. So the bounty slice would be my first pick. Chocolate Cheesecake Bombs sound amazing can’t wait to try those YUM ? I would try the Boccioni stuffed meatballs with zucchini noodles. I have just added a sprializer to my kitchen and looking for inspiration. The book looks good. Is it wrong I skipped right to the treats ? Cookies and cream ice cream is what I would love to make and many more. Would love to try the macadamia satay chicken and cauliflower rice! Hi. I would love to try the shepherds pie with cauliflower mash. It reminds me of my childhood, but now is something that I can include as a healthy version of an old staple. Coconut and lime panda cotta. As its df and gf and it’s somethings we haven’t had before. We hear people talking how yummy pan a cotta is. LCHF real lasagne, kids love it, a healthier version is even better! I love desserts…would try most of the desserts ? Definitely almond pancakes. I’m trying to teach my kids the importance of a nutritious breakfast made with real food! I would love to try the brown butter mushroom soup sound yummy and hearty. I’ll have to say the bullet proof COFFEE! I have to, in the mornings, awaken my brain cells one at a time and coffe does the trick!! Then I can face the day to try all the other recipes! Yumbo! Would love to make the crackers and also the Thai pumpkin & cauliflower soup mmmm all look good! I’d love to try the lchf real lasagna or the bread the two things I miss the most with lchf ? Do I really have to choose only 1. They all sound delish. ? Would love to make some delicious GF pizza bases for my newly diagnosed coeliac husband and daughter. We miss homemade pizza! Wow! What a great selection of recipes to choose from for my thermomix. Being the ‘sweet’ girl that I am – I love chocolate and mint and so my eyes went straight to the After Dinner Mint Slice! Yup that would be my first thing to make and look forward to balancing that out with all those savoury dishes!! Would love to make the feta avocado smash on toast. Would feel like I have a cafe in my own home as it is one of my favourite cafe dishes. How could one go past creamy coffee ice cream!! I’d love to make the pumpkin scones and cinnamon butter. Perfect for this time of year. I would start with the Bulletproof Coffee to get me moving! Caffeine first! I would make the shepherds pie with cauliflower mash first followed by the panna cotta, which just sounds divine!! So many to choose from! A LCHF lasagna would probably be my first and then on to macadamia satay chicken with cauli rice (have just discovered the kids WILL eat cauliflower rice!). Would also love to try the hollandaise sauce as I’m a bit fussy when it comes to hollandaise – it has to be perfect! My three kids and I make pizza’s every Friday ready for pizza and movie night. We would love to try out this recipe! My three kids and I make pizza’s every Friday ready for pizza and movie night. We would love to try out the super pizza dough! The Grass-fed beef burger sounds yummo! Cookies and cream ice cream! Nom, nom, nom ? My problem with diets is, I have a sweet tooth and need yummy stuff after dinner, so I think I would make the After Dinner Mint Slice or any on the dessert list. Decisions, decisions! Mayonnaise 6 was sounds interesting so that might be first of any to try! My husband loves rice and potato so I would love to make all the recipes replacing rice and potato with cauliflower so I can make meals we can both eat! Would love to try the Cinnamon Berry Porridge, LCHF Real Lasagne, really miss my pasta being LCHF dieter and the Cookies and Ice Cream…Have been LCHF for 6 years now. Best food regime for bodybuilding with women. I am a relatively newcomer to thermomix cooking, so everything looks good. would be great to have the chance to cook recipes that are good for my whole family. I would love to make the Macadamia satay chicken with cauliflower rice as I have never made that before, Great work, love these recipes!! The book looks amazing, the recipes look great – I want to try the lotta. I think my favourite would have to be coconut and lime panna cotta. With these tasty recipes I can’t go wrong. And to get the book, I don’t have to be wealthy! We really miss a good lasagna so would love to make the LCHF real lassagna for the family. I’d love to make the bullet proof coffee and creamy coffee ice cream! Blueberry muffin breakfast smoothie sounds yummo!! I don’t know what a Stromboli is, but it has ham and cheese and that’s always a winner for breakfast. I like the sound of coffee you can make different ways too, so that’s breakfast sorted. For lunch, I’ll have last night’s leftover macadamia satay chicken and cauliflower rice. And for dinner I think we’ll have bocconcini stuffed meatballs with the zoodles and sauce. Oh, and my daughter just said we need to include dessert and thinks the chocolate cheesecake butter bombs sound like a great idea. But we decided that if we could only choose one thing, we’d make the pumpkin scones with cinnamon butter. The feta and avocado smash, since I would like to buy a house and the article last week stated that if I went out for avocado smash I would never be able to!!! 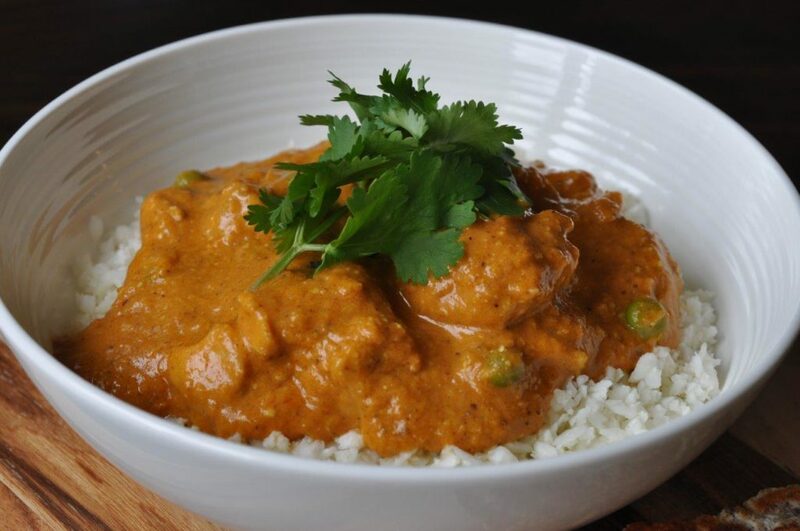 I would love to try the Butter Chicken with Cauliflower rice. my husband was recently diagnosed as type 2 diabetic. Trying to find low carb, high fibre recipes for my thermomix has been difficult. This book would be perfect for us! Would love to try LCHF Lasagne because this is one meal that I love but rarely eat because of the high fat content. To find a recipe that tastes good including a far healthier approach would be fantastic and made on a regular basis. Would love to tryLCHF Lasagne because this is one meal that I love but rarely make due to the high fat content. To find a recipe that tastes good including a far healthier approach would be fantastic and made on a regular basis especially for friends. LCHF lasagne….since finding out I am gluten intolerant I have really missed a good old fashioned lasagne. Having just tested the amazing Butter Chicken With Cauliflower Rice recipe, to the absolute delight of my son, having selected this as his favourite meal for his 18th Birthday family dinner. His usual response to my cooking for the last few years since my Coeliac diagnosis is “I suppose that’s another of your horrible Gluten free substitute attempts, is it???”). With his satisfaction on the rise, we now long to try the LHCF Lasagne. The Thermofoodie and the Chef video is an inspiring introduction, so I longingly await the availability of the new cookbook ‘Getting started’. I could allude to Pavlov’s Dogs, but the saliva is already building up and I can’t bear to think about it any longer, I just want to see the book now! Mmmmm! Just have to wait for the book to come out! Looks like a great collection of recipes but the ham and cheese Stromboli caught my eye, as did the super dough. Both would be so helpful to make some savoury lunch box options for my kids. I’d love to win this book! I think I’d have to go with the billet proof coffee and feta and avocado smash and then…is it bad to have cookies and cream ice cream straight after breaky??? I have a big sweet tooth so would love to try any of the sweet recipes, particularly the after dinner mint slice! I would love to try the mayonnaise 6 ways recipes as my kids love mayo and go through the store bought jars really quickly. I love my risottos but my hips don’t!!! I’d make the chicken & mushroom cauliosotto!!! Too hard to pick one so I’d make the ham & cheese Stromboli, the Macadamia satay chicken with cauliflower rice and the Chocolate cheesecake butter bombs because they sound delish! Mmmmm….. Pumpkin Scones & Cinnamon Butter sounds like a must make!! So many to choose from but I’d first try the Raspberry Swirl Cheesecake! Would love to win a copy! Loved this episode of the podcast 🙂 The meal that I would try first would have to be the macadamia satay chicken. I love satay chicken and am intrigued by this recipe title!! Great choices but find it hard to choose just one! I have a friend and a family member with sight problems therefore I would choose the blueberry cheesecake bliss balls. Our home grown blueberries are ripening so fast and in need of a good recipe. Also blueberries are one of many antioxidants recommended for sight problems. A LCHF Thermomix recipe book? OMG! This is what I need! I have wanted to start this WOE as I need to lose about 80kg but couldn’t fathom cooking for breakfast, I notice a Blueberry Muffin Breakfast Smoothie! Well that’s more like it! Need Bulletproof Coffee recipe stat….. I totally struggle for recipes for Breakfast but the Almond Pancakes with mascarpone and raspberries and the lasagne would be my first choices. My other half is totally negative on LCHF foods, but lately I have snuck a few in and he never knew the difference. Hopefully we can both lose weight and get healthier, and look forward to a slimmer me for my daughters wedding in April next yr….. I will make the blueberry muffin breakfast smoothie to kickstart the day ? I would love to try the After dinner mint slice as I’m loving mint flavours at the moment. What an incredible collection of recipes. Love the sound of the Macadamia satay. I would love to make the bounty slice and the pumpkin scones ? I would love to try the super dough. I would love to make home made pizzas for my family again! Gluten free cookies and cream ice cream! I miss out on this yummy dessert usually because there full of gluten bickies! I’d love to try the super dough pizza recipe! Well I just spent the last 20 minutes trying to decide what to have a go at first. So many temptations in one book!! Settled on Chocolate Fudge Cupcakes because we should always eat dessert first and chocolate makes everything better ? Butter chicken and cauliflower rice! The picture above looks soooooo good! Our son and I LOVE LOVE LOVE crackers so it would have to be your Linseed, Parmesan and Sea Salt Crackers ??? Coconut and lime pannacotta ! You had me at Bocconcini stuffed meatballs (with zucchini noodles and marinara sauce). They sounds phenomenal! The after dinner mint slice is what caught my eye! I would love to try the pumpkin scones, I don’t get to have scones anymore and they sound super yummy!! Oooow for me, I’d love to be able make the After Dinner Mint Slice thanks! As a single mum to an 18 month old who loves chia puddings but mummy finds hard to master is love to make the spiced granola with chia puddings….and maybe the coffee for me to get through the day! !